EDGE periodically introduces its artists. We feature current work, past work, and how things are changing. My specialty is what I call “thread sculpture.” For many years I had been creating landscape art quilts, and particularly enjoyed the technique known as “thread painting,” densely machine-stitching parts of the scene like a painter would brush on paint. Eventually I came to realize that I love thread so much, I dropped out the fabric. The artwork continues to evolve, but not my philosophy: fiber art should take advantage of its own nature, and not try to be a painting, a photograph, or an object made with traditional sculptural media. I don&apos;t need to look far for inspiration. A good piece of advice I heard early on was to make art about what you personally know. Many of my artworks are inspired by where I live. The daily connection I have with the trees in my yard (such as the elms I planted as seeds), the neighborhood&apos;s stream, or the songbirds who visit my feeder, make it more interesting to translate experience into a tangible form. Also, some of my pieces are influenced by living in the suburbs of Washington, DC. National news is our local news. I have expressed my worldview in a series that comments on the American social and political landscape. Above: Kelp Forest Teapot, 6 x 7 x 5 inches. Machine and hand stitched, cotton and metallic threads. Right: Elm Tree Teapot, 9 x 9 x 6 inches. Machine and hand stitched, cotton threads. Top: Furl, 14 x 19 x 7 inches . My intent with this shrine-like piece was to show a beautiful place that, when you look closer, isn’t what it seems. The scene is the view from a footbridge. Run-off from the neighborhood causes the water level to rise rapidly. The flow had seriously eroded the stream banks over several years, undercutting the trees, particularly a huge old oak whose roots dangle below the thinning soil. Two weeks after I made this piece, the tree fell. I originally focused on improvisational piecing and occasionally return to that technique. Much of my work benefits from my husband’s and other family members’ photography skills. I draw ideas from their photos then research the subject before transforming those images into fiber art creations. In addition, I collaborate with my husband, who uses his computer expertise to manipulate photographs, print images on fabric, and create unique colors and textures that I then use in my fiber art. Currently, I am exploring and experimenting with dyeing techniques such as ice dyeing and eco printing. I learn new techniques to expand my repertoire so that I can use the best technique for a given piece and often adding emphasis with thread painting. Birds seem to be an on-going focus: I love their freedom of flight and quirky and quick movements. 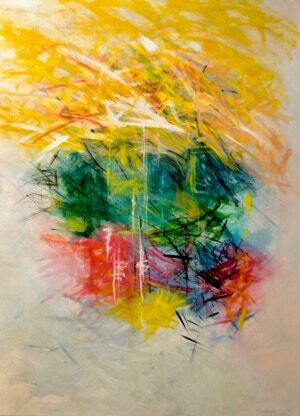 My current abstract works intuitively mark a mental journey of time and place. Beginning with manageably-sized works on paper has allowed me to work serendipitously, exploring figure/ground relationships while expressing the thoughts and memories of a singular day or place in time. I now alternate between these and large-scale paintings on stretched canvas. I use layers of mixed media, which frequently includes hand stitched thread. I create each artwork without figurative form, allowing the viewers to become the human element interacting with the abstract landscape and their own personal narratives and memories. Here is the work of Sharon Bass, who has served as the EDGE curator for 10 years. She has chosen to show detail images from three pieces of work. You can see more of her work at her website. I often work in series. The image above is a detail from the Line Series, this one titled Fenceline. (far left): A detail from Treeline. (left): A detail of silk aspen leaves, machine stitched, embroidered and assembled for a temporary installation at Rocky Mountain National Park, 2009.